Cold, refreshing and good for you, these frozen yogurt granola cups are the perfect summer snacks. Made with just 2 basic ingredients but customizable in so many ways, they’re fun to make and even funner to eat. Nothing beats cold food on a hot summer day. I’m an ice cream and popsicle girl myself (ok, maybe throw in a few cocktails in there!) but I do love these frozen yogurt granola cups. Made with homemade granola (you can use your favourite store brand), Greek yogurt (you can use your favourite kind of yogurt) and your optional choice of mix-ins, you know they’re healthy so you can snack on ‘em all summer long without the guilt! What are glassine paper cups? feel closer to wax paper – it’s smoother and shinier. Think: candy wrapper. They are perfect for things like chocolate (they’re what I use for my Dried Mango Chocolate Bites) because they won’t stick. And they’re what I recommend here. While normal cupcake liners would work, you’d need to carefully unwrap the granola cups out of them and make sure to get all the paper off. With glassine, they slide right out. That’s really the hardest decision you’re going to have to make when making these. Everything else is easy peasy. Take granola and Greek yogurt then layer them in the cups. You can stop there and be perfectly happy! Or you can choose to mix fruit compote, curd or jam with the yogurt or simply sweeten it with honey. Then you can you top the cups with your favourite berries, nuts or whatever else you have on hand. 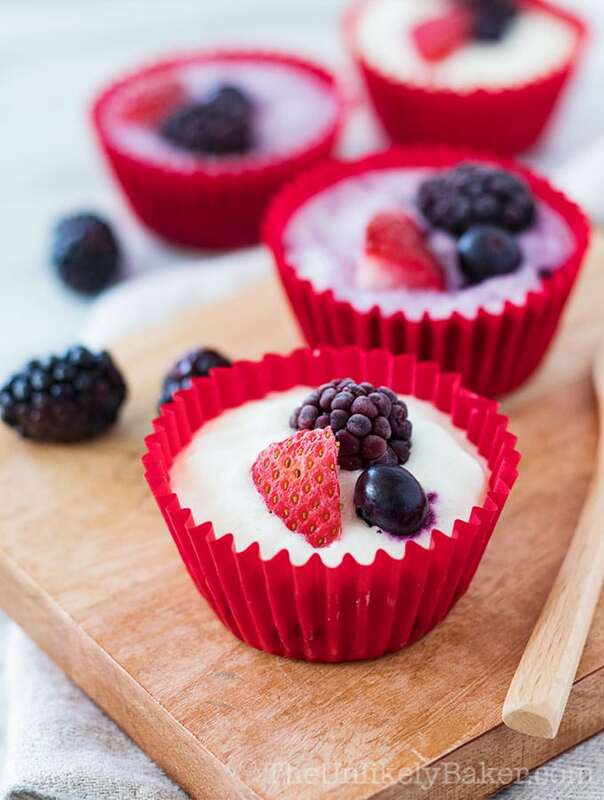 Put the cups in the freezer and after a couple hours, you have delicious, healthy, yogurt cups that you can bite into, spoon out of a bowl or eat however you want! These yogurt cups are great for breakfast too. Make them the night before and literally grab and go the next day. Easy! Have a wonderful day! 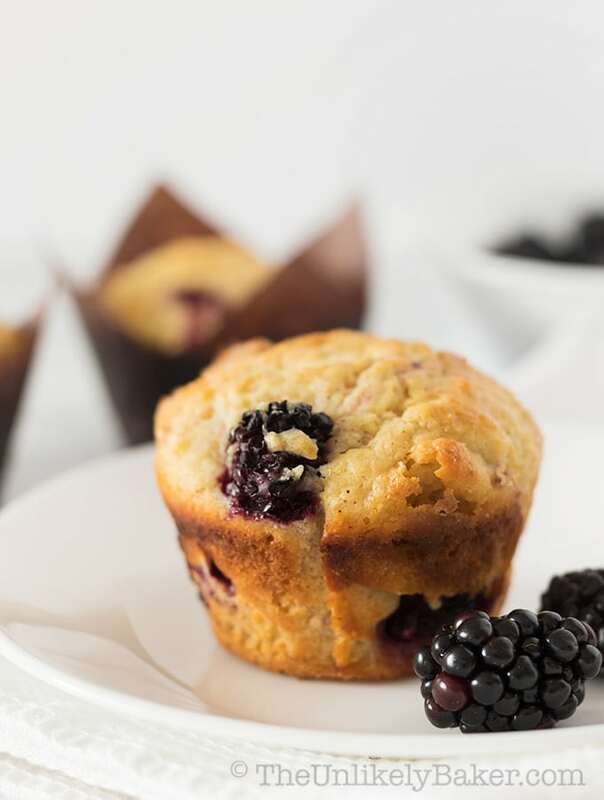 Line a 12-cup cupcake or muffin pan with cupcake liners. Place equal amounts of granola in each cup. Top with yogurt (see note 1) and freeze for 2-4 hours or until the yogurt is frozen (see note 2). 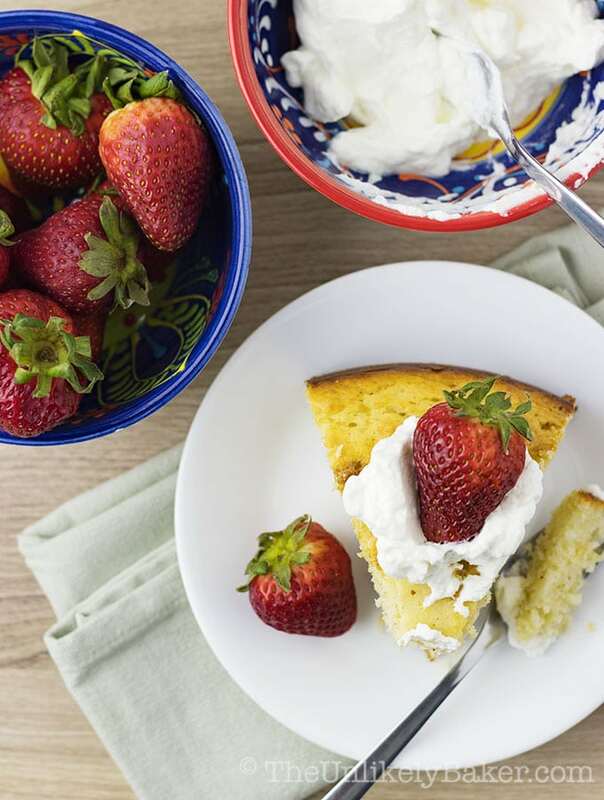 To add flavour to your yogurt, you can add your favourite jam, fruit curd or honey to taste. Just stir into your yogurt until incorporated. Optional toppings include: berries, seasonal fruit, nuts, even chocolate! You can add them before you freeze the yogurt cups or before you serve/eat them. Did you make frozen yogurt granola cups? What’s your favourite summer snack? I’d love to hear from you in the comments section below. Hi, I just wanted to say my kids love your yogurt cups. I made them into pops and did as you suggested by flavoring them with jam. A mom’s trick to getting them to eat yogurt instead of ice cream he he. My youngest enjoyed helping me make them. We’re going to be making more. Thank you for a simple but delicious recipe. I’m so happy to hear that Larissa! And what a great idea to turn them into pops. Hope you’re have a fab summer! These are so cute and tasty looking! I love that you only need 2 ingredients …. who wouldn’t. I can’t wait to give this a try! When the kiddos are clamoring for a snack these frozen yogurt granola cups are fantastic. Heck, they’d be great for adults too. A nice pick me up snack in the afternoons. Much better than high sugar snacks. I love frozen yogurt and granola. Often it is my choice of dessert when I want to binge. I love that this is only two ingredients. I must try this soon. Omg…the pictures look so delicious. I need to try these sometime. Everything looks so yummy and scrumptious. This recipe sounds delicious. Looks like you made with the exact ingredients as I would. The Glassine cupcake liners sound much better than the old paper ones… sounds a little more classy. This is such a good and healthy recipe!I’m always looking for healthy ideas like this for my kids school and events. I have a feeling I’d love this too! I think this is the healthiest frozen treat I have seen by far! Thanks for sharing the recipe. This will be our weekend treat! I’m all about anything that’s only two ingredients! They look yummy! Excuse me while I lick the screen! This looks so perfect and delicious for a hot summer day. I’m definitely going to add this to our desert arsenal! 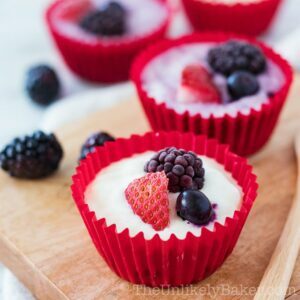 Those yogurt cups look amazing – and so simply perfect. I love the tip on the wrappers. Food stuck in my wrappers is always a pet peeve! Mine too! They are a little bit more expensive than regular wrappers but I buy them in bulk at my local baking supplies store so I don’t have to think about it again (at least for some time lol). Trying new recipes is exciting! Hope you like this one. I can eat yogurt only during summer! But I love adding fruits and granola I think is making with yogurt a tasty combination. These granola cups look so good. I think they would be perfect for enjoying for breakfast and like how easy they are to make. Those paper liners are amazing. I ma going to have to hunt them down. Two ingredients sounds like perfection to me! I am thinking of all the flavors of yogurt I can use! Absolutely! I love how this recipe is super customizable. So you can put all your favourite things. I have not seen a recipe like this. I can’t wait to make these (and not share them with anyone). So simple, yet they look so refreshing! I make yogurt parfaits to grab and go, but I never thought about freezing them! I am going to try this soon and I can’t wait!! I’d appreciate it if you would move close to me so that you can make these for me!! I’m a terrible cook and even worse baker… but dang I want to try these out!! LOL! Lucky for you, you neither have to cook or bake these! These look delicious! What a great, healthy dessert or snack! I feel like you could personalize these so many different ways, too, especially for picky kids. We had lots of fun trying out different flavour combinations. Hope you find your favourite! YUP! I would so be on board with this recipe if I could eat yogurt and granola! Looks super tasty! Wow with the heat we have had the last 3 weeks, these would have been great. I will have to make some. I love those little silicone cups. We have the grandkids 2 days a week all summer long. I am always on the lookout for healthy treats to make them…and they love helping me too. I can indulge into this healthy snack alternative. Granola cups can also pass as dessert. I love these frozen yogurt granola cups, they really are easy to make too. I am all about 2 ingredient ideas. They’re great aren’t they? Love how you can mix and match. These frozen yogurt granola cups are a delicious way to cool down this summer. I like this not only because it is delicious, but because it is healthy too! A total winner in my book. I’ve never heard of glassine cupcake liners. It’s interesting you mention the cups will slide right off, I have used silicone when I wanted that, I’m wondering if they’re similar. Hi Val. Glassine liners are disposable and I think silicone ones are washable and reusable? Love this idea of a frozen yogurt plus granola cup! A perfect cooking treat or a great breakfast item as you suggested. 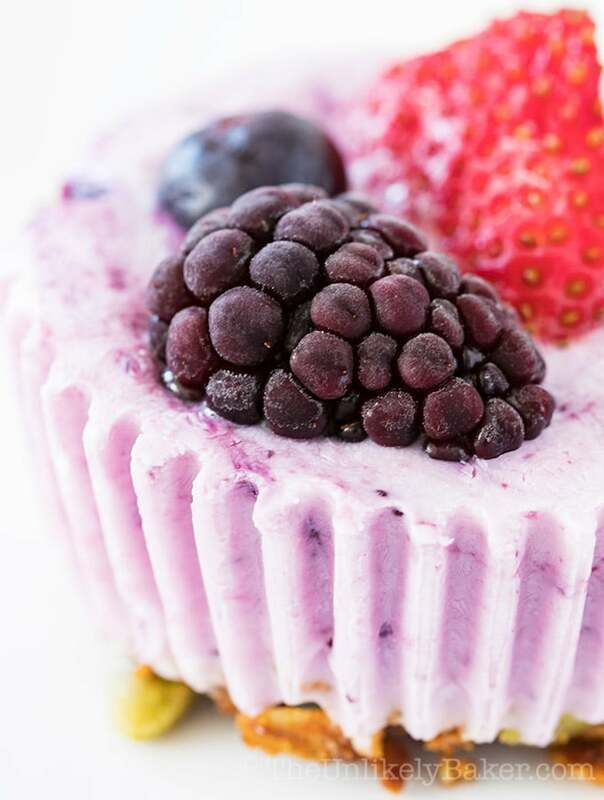 I love berries, so adding frozen fruit makes them even more yummy. This is the kind of recipe I can for sure do! Easy and perfect for summer! I wish my kids would eat these. Maybe once we finish all the ice cream in the freezer I will have to replace it with these. 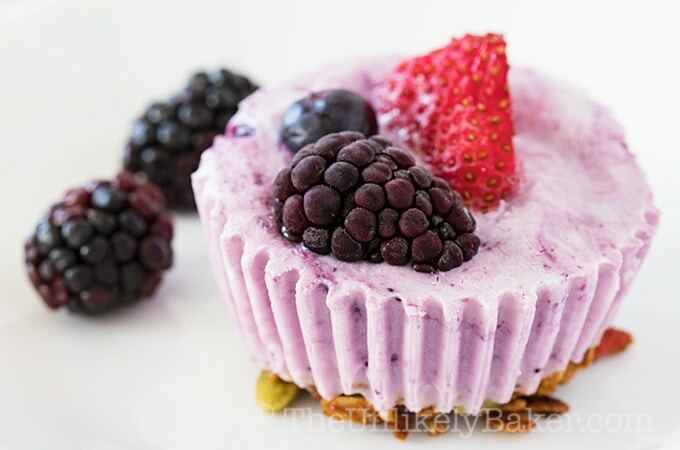 These Frozen Yogurt Granola Cups look so good and I love that it is only 2 ingredients. They will be the perfect treat on a hot afternoon. I always have a big love for cup-sized food like this, what a cute recipe to try. Thank you for sharing! !